The free report, published by Monroe, Wash.-based Ambient Insight, predicts a five-year compound annual growth rate, or CAGR, of negative 6.4 percent for self-paced courseware, translating into an anticipated $13.3 billion drop in worldwide revenue from 2015 to 2021. The report defines self-paced courseware as being accessed on a desktop or laptop and spanning the K-12, higher education, corporate training, and privately marketed software (such as that produced by language-learning company Rosetta Stone) sectors. 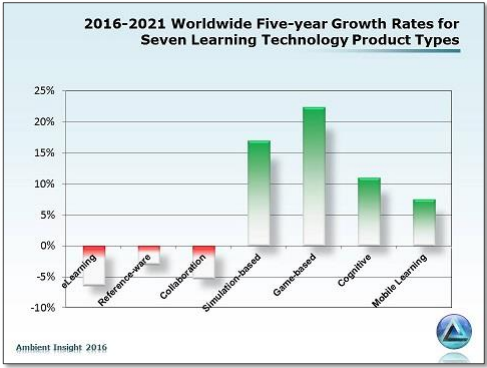 However, sales of mobile learning, simulation-based learning, game-based learning, and “brain-training” software are all on the rise. These increases are cited as major factors in the global decline of computer-based educational and professional training software. In contrast to the slowing e-learning market, each of these new product classes are expected to see sturdy growth of at least 7.5 percent in the next five years. Other market inhibitors are contributing to what the researchers called a “perfect storm” for self-paced e-learning products, including a fully saturated market with numerous vendors driving down prices and profit margins; a “collapse” of the market for learning management systems products globally; and a “leapfrog” effect in which developing countries are skipping self-paced e-learning and moving directly to mobile or game-based learning, the report finds. Globally, the market for self-paced e-learning is hamstrung by ominous forecasts in the United States and China, the two largest markets for the class of products. Latin America is also expected to see a drastic reduction in e-learning revenue, in large part due to troubled Brazilian and Venezuelan economies. The only region expected to see a modicum of growth in e-learning revenue over the next five years is Africa, with a CAGR of .9 percent, while the markets in Western and Eastern Europe are expected to stay relatively stable at a CAGR of negative 1.5 percent and negative 1.1 percent, respectively. One headwind specific to the U.S. market is the trend toward open and free educational resources, or OER. Since the U.S. Department of Education has required that products developed with department dollars have open licenses, the market has seen an increase in free or affordable e-learning products, putting a damper on revenue for commercial products in the preK-12 sector. Similarly, the trend toward OER and greater competition among vendors is also expected to negatively impact the LMS market. According to projections, revenues for LMS products are expected to drop to $1.5 billion in 2021 from $2.7 billion in 2016. “the recent steep declines in the e-learning industry essentially mean that the e-learning era is effectively over. The product has reached the end of its product life cycle and simply cannot compete with new learning technology products on the market.” It may be shrinking but I suggest that the reason why is merely speculation. The e-learning sector has suffered the experience of being the subject of a land-grab and stampeded with untrained carpetbaggers; multimedia developers and teachers who diminished the field to something they understood rather than up-skilling to meet the challenge. With those dilettantes moving on, the self-paced market might finally get its chance. I’ve known talented people who quit the sector in despair in face of that tsunami of mediocrity. Those people may return. People who realise they have a responsibility to keep abreast of developments in neuroscience, education psychology, androgogy, cognitive psychology, education research from reputable sources, usability and Human-Computer Interaction. I’m equally sceptical of the increase in other modes of e-learning. I’ve worked with people who turned away from Captivate because they didn’t know how to get the best from it and insisted the problem was not their lack of ability but shortcomings in the package, and these carpetbaggers are flocking to new modes of delivery in the hope it’ll make them rich without actually accepting they, themselves, need to do quite a bit of learning. I absolutely agree with James. I also add that the trend towards “free” is quite disturbing. How can a developer/vendor compete with free? Especially if people don’t care about quality. Someone, somewhere has to pay for innovative development and ongoing support. Does it come from advertising? Do we rely on philanthropic development by major companies who make their money outside of education? If so, how true will they remain to advancing education? How responsive can they be? I think that one of the big problems is that edtech, by-and-large, is oriented towards replacing and devaluing teachers. Certainly, it can be more fun through gamification, but brain-training games are of questionable help in K-12, and mobile moves the cost burden to families and reduces satisfaction through performance and user experience hits when true high-speed Internet and cloud access is not available ubiquitously and affordable. James, as I mentioned in my post below commenting on the article itself, this is nothing new. I saw exactly the same thing in the 1990’s with the rush to provide computer software on floppy disk – and then CDROM, in the 1990’s. Way too many saw educational software as an fast-buck opportunity and the ensuing “gold rush” saw the market collapse between 1998 – 2000, and I had an absolute field day cherry-picking from the wreckage that resulted. But the education market is like no other, especially when you consider there is no clearly defined route to market as there is in the retail industry where the manufacturer to end-user infrastructure ensures much greater longevity for a physical product. But the education market will always remain and secret lies in understanding and defining your market, and providing what they need, rather than what we think they need. The vast majority of investment in providing edtech services and products is a disaster waiting to happen, firstly because those involved in the investment decision making process have little understanding of the market and how it works, and secondly most of the products and services are nothing more than a patch-up to a very archaic way of trying to mass-produce education. At the same time, unless you have extremely deep pockets – that does not rely on third-parties constantly providing support cash, then collaboration is the only answer. And that is the biggest single problem, because most founders/owners see what they are providing as being the next uber-solution, and totally overvalue their position. They disappear into the wilderness with nothing and few are ever heard of again. There will always be those that think “free” is a problem in education, and similarly there have always been those that were frustrated because they thought others did not appreciate their efforts to provide quality. But at the end of the day it always comes back to those three things I have mentioned, which simply translates into thinking outside the square, and doing things where others are unlikely to be able to follow. Leo – a 5 year growth rate of -6.4% is not ‘falling precipitously’. Rather, more like a leveling off. And while still $150b over five years, I hardly would say that the eLearning era ‘is essentially over’. I am glad that Ambient Insight is getting out of the business – not much in the way of insights from those guys. Hey, this is no great shock or surprise … especially if you worked in and around education and learning during the 1990’s when we saw the rise and then fall of educational software as the access to the internet came about. In fact I see this as a good thing because history has always had much to teach us. However for those that thought this was simply all about making content available online, I am sure it will be devastating. But that’s great because this spells further opportunity. The secret to working in the education market, is defining your market, and understanding it’s needs. For example, while many see K-12 education as one market, I have always seen it as at least 17 different markets, because to understand the market, you need to define the niches that make up the market as a whole. Far too many see education, and think schools and colleges. For those people this news may come as a shock because they are the very people that have caused a plethora of content to become available online, without really understanding what the needs of children and students are. Exactly the same happened in the 1990’s when everyone rushed to provide educational software. The problems of continuing to use a 200 year old way to educate our young people will never be resolved by simply throwing content at kids. And the vast majority of edtech investment over the last 5 – 7 years, has involved products and services that do little more than patch up a system of trying to mass-produce education. Yet the 21st century needs much more. So for those many content providers that struggle to “keep the doors open” and want to look at options, think collaboration and contact me. Longevity in education has always been about collaboration rather than a one-horse race and thinking you have the next Uber-product and can do it all on your own. And that is something that the majority of EdTech investors and VC’s have never understood. That’s a clean report on the next 5 years out-come of the e learning industry, get the guns ready for the next generation learning needs. Technology would never die including education technology . You seem to be happy now since you will not lose your jobs ., But you cannot prevent technology to come . Sure we need better education technologies than today’s . Even at the same work site, security personnel may be outfitted differently to suit their individual responsibilities. For example, security officers assigned to outdoor foot patrol may wear military style uniforms made with sturdier fabrics to suit the climate; while the security officer at the front desk is attired in a dress shirt and suit. Nicholas Tee says ( see comments above) : ” Far too many see education, and think schools and colleges. For those people this news may come as a shock because they are the very people that have caused a plethora of content to become available online, without really understanding what the needs of children and students are”. Nicholas, you are ” spot on! “. Everyone in the LMS market identify the K-12 or the secondary education market as their idea of a gold mine. No one is looking at the “I don’t want to ( or I cannot) go to college education market” that is estimated to be at least 65% of the $ 7 trillion US secondary education market. Our niche is to provide workforce readiness, start-a-business and soft-skills training to middle class and lower middle class education candidates. We do this by training community and non-profit organization trainers to do the training in their communities. They receive billions of dollars in Federal and foundation grants to do this and we want to tap into this market. Right now, they only offer LIVE training. This market is ripe for online education, as this markets clients want more education, but they have to work long hours and low paying jobs that are necessary for their survival. Many would be happy to take a short online certificate training course on their tablets or phones as opposed to long hours of degree training because it is easier to get an immediate certificate vs. four years of training for a degree that will be obsolete when their training is completed ( see Georgetown University Study). The LMS market is not dying, it is re-inventing itself to accommodate the real needs of college drop-outs (65% nationwide), high school drop-out ( 55% nationwide) and people who just do not have the time to spend training, for whatever reason.